Donate to DPP and Help Build Healthier Communities! Denver Pet Partners is a registered 501(c)(3) non-profit corporation (EIN: 20-0429526). It is a volunteer-run organization. We receive no government funding and rely on individuals, foundations and corporations for financial support. Your donation is applied directly to supporting our program of providing education and conducting assessments of volunteer handler-animal teams, and makes it possible for us to set-up and administer visiting animal programs including delivering safe and effective animal-assisted intervention (AAI) services. Thank you for your support in helping us build healthier communities! DPP is grateful to be part of the Colorado Gives campaign. Donations to DPP can be made by clicking the logo below. DPP gratefully accepts donations through PayPal or through a check. Please make checks payable to Denver Pet Partners and mail them to Denver Pet Partners, P.O. Box 271505, Littleton, CO 80127-1505. Note: If you are making a donation in honor or in memory of someone and would like us to send acknowledgement to that person or their family, please include that information with your check or on the PayPal notes section. Network for Good powers more digital giving than any other platform. We provide nonprofits, corporations, and software developers with simple solutions to power the good they do with supporters, employees, and consumers. Since 2001, we’ve processed over $1 billion for over 100,000 nonprofits. Our donor advised fund is accredited by the Better Business Bureau Wise Giving Alliance and meets all 20 of its standards for charity accountability. You can view our accreditation information here. Established in 1997, iGive.com is an Internet company whose goal is to enable the economic power of individuals to benefit their chosen communities. We hope that in the near future, all consumer transactions contain a percentage that benefit causes close to home. Hundreds of thousands of iGive shoppers have raised over $5,000,000 for their favorite causes – all at no cost. Just go to: www.igive.com/DPP and DPP will be selected to receive your iGive earnings. If you don’t have an iGive account you can create one easily in a few minutes. Your iGive account is free and private. Almost everyone shops at Amazon.com at one point. Amazon has created their “Amazon Smile” program to benefit registered 501(c)(3) organizations such as DPP. Just click this link: http:/smile.amazon.com/ch/20-0429526, then sign in to your Amazon.com account and shop as usual. Amazon will donate .5% of sales to DPP. It’s that simple. For more information on this new program, click here. 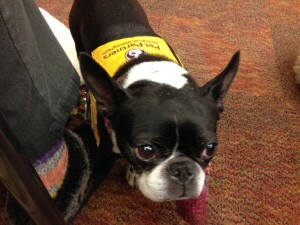 A donation of $25 can pay for a vest for one of our therapy dogs. A donation of $100 can pay for a scholarship to help someone attend a one-day handler training course. A donation of $500 can pay for materials and expenses to teach a literacy mentorship course to 20 students. A donation of $1000 can pay for 35 handler training course manuals.